Sorry about the delay getting this post up. The release of the Disney Summer 2020 Cruise grabbed my attention, we booked a Greek Isles cruise. Back to the Trip report. With just two days remaining in London before the cruise, we wanted to make the most of our time; we wanted to visit the Victoria and Albert Museum. We are big fans of the TV show Victoria, I highly recommend it. The Natural History Museum is next to the V&A museum, so we stopped there first. The Natural History Museum is huge. I didn’t research it before we arrived and was surprised at the massive size. If you have kids, it is worth planning a day there. This is “Hope”, a 25.2-metre blue whale skeleton in Hintze Hall. She has been in residence here, in Hintze Hall, since 2017. If you are a photographer bring your tripod and wide-angle lens. The hall that contains the Mineralogy collections is immense. My daughter loves rocks and minerals. We spent almost two hours in this hall as she checked every single specimen on display. I’m not as interested in minerals; luckily there were benches in the hall, and the museum offers free wi-fi. Make sure you spend some time in the Cadogan Gallery. 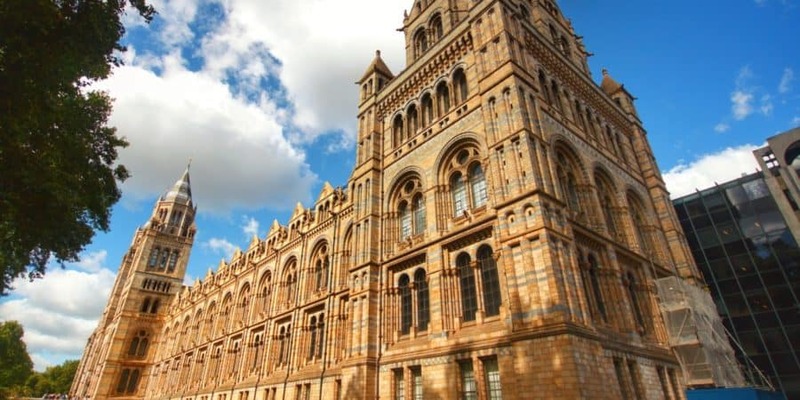 You can see many of the treasures of the Natural History Museum there. As we were visiting the different exhibits, it became apparent we should have planned to spend the whole day to see everything. It was nearly closing time—6 PM (18:00)—when we made our way to the exit. Luckily for us, it was Friday and the Victoria and Albert Museum is open until 10 PM (22:00). The Victoria and Albert museum is very different than the Natural History Museum. The V&A is the world’s leading museum of art and design, housing a permanent collection of over 2.3 million objects that span over 5,000 years of human creativity. The Museum holds many of the UK’s national collections and houses some of the greatest resources for the study of architecture, furniture, fashion, textiles, photography, sculpture, painting, jewellery, glass, ceramics, book arts, Asian art and design, theatre and performance. Friday nights at the museum they have a DJ and a bar set-up in the main entry hall. Unfortunately, while open late, many of the exhibitions are closed. It is a good time to visit if you are looking for a different museum experience, but disappointing if the gallery you would like to see is closed. An example of something that was not running on a Friday night is the carpet in the photo above. The light above the carpet is only on for a minute every 15 minutes, (my times may be a little off), to protect the colour of the carpet from the light. We waited for the light to come on, but it never did, there was a bit of a crowd waiting to see it. There are many fascinating exhibits including Tipu’s Tiger. ‘Tipu’s Tiger’ was made for Tipu Sultan, ruler of Mysore in South India from 1782 to 1799. It is a life-sized wooden tiger that mauls a European soldier. I think that half a day at the V&A would be enough. Be sure to check to see if they have any special exhibits on while you are visiting. There a was a Frida Kahlo exhibit when we were there, unfortunately, there were no tickets available the day we were there. After a long day at both museums, we chose to get a cab home. With only one more day left in London, we grabbed a bite to eat and headed to bed. Our plans for Saturday included a visit to the National Gallery and meeting up with some friends for tea. If you enjoyed this post and wanted to read more about our trip please check out my other posts about our planning, travelling to London, our first day in London, visiting the Borough Market, our visit to the British Museum and Tour for Muggles, Tower of London and Westminster Abbey. As well as stateroom tours of our secret porthole rooms 6006 and 5520.